شیرازی, محمود. (1394). تعیین میزان شیوع اضطراب امتحان و ارتباط آن با عملکرد تحصیلی در دانش آموزان دبیرستانی استان سیستان و بلوچستان. نشریه پژوهش در نظام های آموزشی, 9(30), 167-186. محمود شیرازی. "تعیین میزان شیوع اضطراب امتحان و ارتباط آن با عملکرد تحصیلی در دانش آموزان دبیرستانی استان سیستان و بلوچستان". نشریه پژوهش در نظام های آموزشی, 9, 30, 1394, 167-186. شیرازی, محمود. (1394). 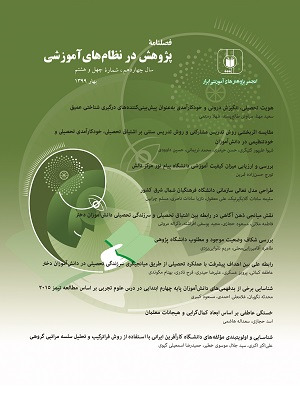 'تعیین میزان شیوع اضطراب امتحان و ارتباط آن با عملکرد تحصیلی در دانش آموزان دبیرستانی استان سیستان و بلوچستان', نشریه پژوهش در نظام های آموزشی, 9(30), pp. 167-186. شیرازی, محمود. تعیین میزان شیوع اضطراب امتحان و ارتباط آن با عملکرد تحصیلی در دانش آموزان دبیرستانی استان سیستان و بلوچستان. نشریه پژوهش در نظام های آموزشی, 1394; 9(30): 167-186. رگرسیون برای پیش بینی عملکرد تحصیلی نشان داد که اضطراب امتحان پیش بینی کننده عملکرد تحصیلی است. Andrew, J., Elliot, A., Holly, A., & McGregor, M. CA (2001). Achievement goal framework. Journal of Personality and Social Psychology, 3, 501-519. Bidel ,dc., hughes, s., & terner, mw. (1993).test anxiety in african American school children .school psychology quarterly ,8(2),140-152. Bonaccio, S., Reeve, C .L.,Winford, E. C. (2013). Text anxiety on cognitive ability test can result in differential predictive validity of academic performance. Personality and Individual Differences, 52(4), 497–502. Comunian, A.L. (1993). Anxiety, cognitive interference, and school performance of Italian children. Psychological Reports, 73, 747-54. Dendato, K. M., Diener, D. (1986). Effectiveness of cognitive/relaxation therapy and study-skills training in reducing self-reported anxiety and improving the academic performance of testanxious students.Journal of Counseling Psychology, 33, (2), 131-137. Guida, F., & Ludlow, L. (1989). A cross-cultural study of test anxiety. Journal of Cross-Cultural Psychology, 20, 178-190. Hill, K.T. (1984). Debilitating motivation and testing: A major educational problem,possible Solutions, and policy applications, In R. Ames & C. Ames (Eds), Research on motivation inEducation.student motivation (vol.1). New York: Academic press. Liebert, R. M., & Morris, L. W. (1967). Cognitive and emotional components of test anxiety: A distinction and some initial data. Psychological Reports, 20, 975–978. McDonald, A. S. (2001). The prevalence and effects of test anxiety in school children. Educational Psychology, 21, 89-102. Research and Applications.Lawrence Erlbaum Asssociates, Hillsdale, NJ, pp. 15–42. Sarason, I.G. (1975). Anxiety and self – preoccupation.In I.G. Sarason& C.D. Spielberger (eds.). Stress and Anxity. Vol. 2, New York: Hemisphere/ Hastead. Spielberger, C. D. (1980). The Test Anxiety inventory. Palo Alto, CA; Consulting Psychology, Press, Inc.